It was an early morning for us since we had a 7:00 appointment to be in a service bay. We put most things away last night. We fixed a quick breakfast and pulled in the bay at 6:50. Our service techs started promptly reviewing our list of issues with us and then got right to work. Tiffin received a bad batch of LED lights last year and they start a strobe effect before they actually totally fail. The failure is not that much of a problem because we have so many lights, but the strobe effect is really bothersome. They had already sent us five new ones that Max had replaced. Today when the techs came in to get started another one started flickering. They asked us if we just wanted them to go ahead and change them all out today and they did. Well, they started the process and will complete it Monday. There are over 60 LED lights in our coach. To replace them all takes a while. We also got a new front air conditioner today so tonight we are really cool. Nice. 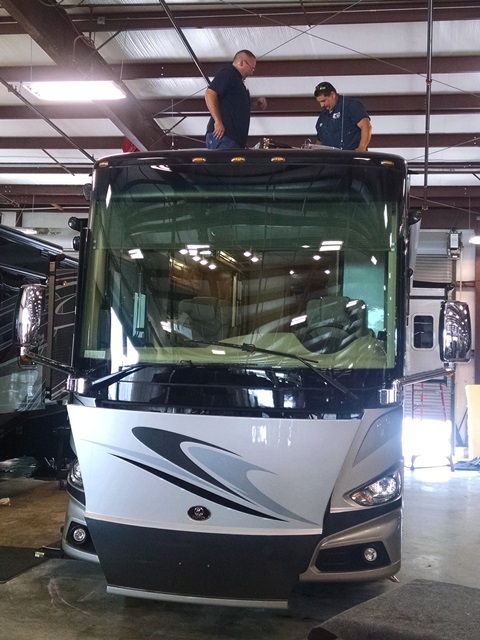 Otherwise they are working on mostly small items such as a loose tail light, loose LED light stripe on awning etc. Our two service techs, as usual, are very professional and are doing a great job. They assure us they will take care of all our concerns and we are sure they will. We think we will probably be here until Tuesday or Wednesday depending on when some parts come in that were ordered today. Tonight we are under a tornado watch so we are in weather watch mode. We are always aware of the safety issues of being in the motor home. Tiffin left the customer lounge open tonight for us to use as a shelter if necessary. Right now the storms appear to be weakening so we are very hopeful that this is all going to dissipate.